* Custom Inside Returns Needed? Click the button below to add the The Great Britain 132 to your wish list. Shelf Depth = 9 7/8"
Body Width = 71 1/4"
Opening Width = 49 1/2"
Standard Return = 2 3/8"
Optional Custom Return = 0" to 2 3/8"
The Great Britain Limestone Heritage Marble Mantel, Circa 1780. George III, English Neoclassical, with large scale and elegant proportionality. Dentil jambs featured along with frieze and side panels free of decoration are standard. 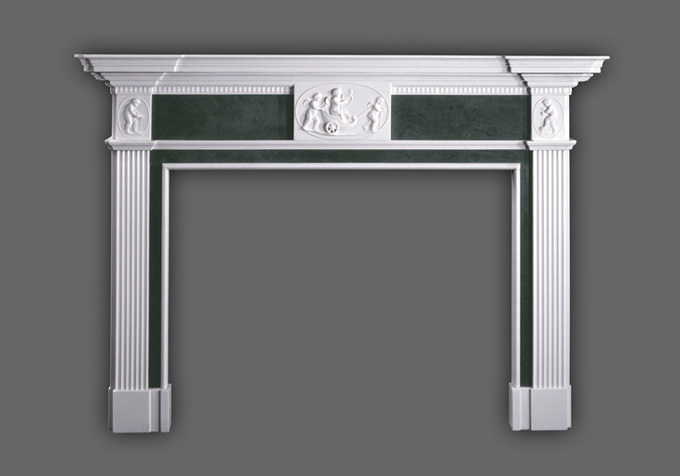 For a softened look you can select to have this mantel graced with a rare Cherub center frieze and cherub side panels. The optional cherubs are shown in a few of the Alternate Images, above. Order the optional returns if your facing projects less than 2 3/8." Enter the precise thickness of your facing if you order optional returns. View the Heritage Marble Mantel Gallery. Feel free to phone in your order. Call (866) 983-3267 M-F.